Co. Cork: Abbestrowry (2), Aghadown, Ardfield, Caharragh (2), Castlehaven (2), Castrumventry, Creagh (2), Drinagh, Drumdaleague, Kilcoe, Kilfaughmabeg, Kilkerranmore, Kilmacabea (2), Kilmoe (2), Mycross, Rathbarry, Roscarbery (2), East Skull, West Skull, Tullagh and Clear. The Board also included 9 ex-officio Guardians, making a total of 36. The Guardians met each week on Saturday at 12.30 pm. The population falling within the Union at the 1831 census had been 94,736 with divisions ranging in size from Ardfield (population 2,023) to Roscarbery (8,714). Skibbereen itself lay across the two divisions of Abbestrowry and Creagh. The new Skibbereen Union workhouse was erected in 1840-1 on a 10.5-acre site a mile to the north of Skibbereen. Designed by the Poor Law Commissioners' architect George Wilkinson, the building was based on one of his standard plans to accommodate 800 inmates. Its construction cost £7,083 plus £1,217 for fittings etc. The workhouse was declared fit for the reception of paupers on 21st December 1841, and received its first admissions on 9th March 1842. The operation of a workhouse had to be financed by the ratepayers of each union and in many places was seen as an intolerable imposition from England and its officials. At the end of 1842, Skibbereen was one of the unions in which anti-English feeling was sufficiently aroused for its ratepayers to resist collection of the rates. The rate-collectors needed the protection of the constabulary, and on one occasion a death occurred during a violent incident. The site location and layout of the Skibbereen workhouse are shown on the 1902 map below. During the famine in the mid-1840s, stable sheds were fitted up to accommodate 40 extra inmates. A fever hospital to accommodate 44 patients was erected at the south of the workhouse. In the middle of the nigh on 22-23 June 1921, the workhouse was burned down by armed Republican forces. The raiders assisted the 130 inmates to the fever hospital. The Sisters of Mercy and workhouse officials remained with the inmates throughout the proceedings. A community hospital now occupies the site although in 2002 a small portion of the original buildings was still standing. One small survival is the single-storey buildings at the northern edge of the site. These may be the stables used as fever wards during the famine. 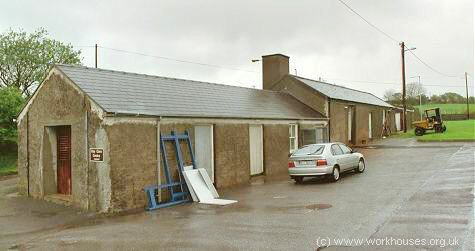 Skibbereen sheds from the south-west, 2002.